Site Features: Fully integrated custom WordPress website that uses WP as a content management system for all site pages. This allows the client to edit page content at will. WP plug-ins include photo gallery options, the ability to manage meta tags for search engine optimization and upload photos and documents. This site also has a robust news feed that keeps company clients informed about upcoming events and class offerings. Design Features: Home page features a tiled format that responds to various devices which can be edited by the client. Subpage & global features: custom fonts, integrated Google Analytics tracking, global & single page SEO customization, site search functions, automatic copyright updating, masked email to combat autobot spam. Our partnership with Small Web Solutions has paid off a hundred-fold with the new interest it has created for our business. I’ve tried to think of the perfect one or two words that best describe the work done for us by Small Web Solutions in creating and maintaining our website…”amazingly creative,” “a perfect partnership,” “attentive to needs,” “quick to respond,” “a lifesaver!” All are accurate, but none of them seem to accurately paint a picture of the great job Jackie Webster has done to help us create and maintain a website to promote our dance studio. 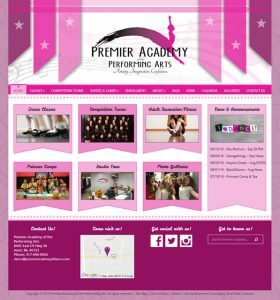 Just over a year ago, Jackie created the new website for Premier Academy. Through a few brief conversations, Jackie was able to pull together all of our ideas and create a website that is exactly what we were looking for. It is attractive, easy to navigate and update, and it has generated a great deal of interest in our business. Better still is that it came with a price tag we could afford. Rarely have we run into difficulty with our website, but on those rare occasions an email to Jackie and we’re quickly back in business. Obviously, we’re extremely pleased with the work that has been done for us by Jackie Webster and Small Web Solutions. We would highly recommend this company for anyone looking to create a new or update their old website. You can’t go wrong!! !